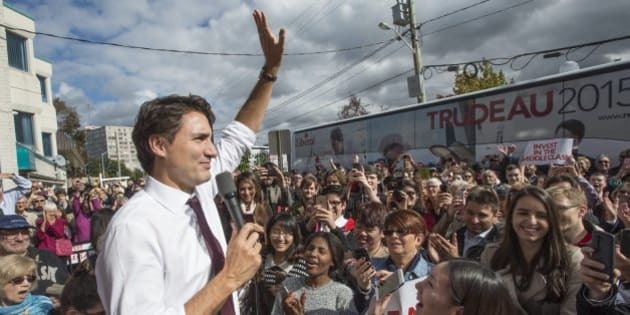 I'm hoping that Mr. Trudeau will surround himself with the best and brightest of the Liberal Party, and with a combination of intelligence, character and willingness to learn, as well as their guidance, he'll grow into the great leader that this country needs and deserves. It's official. Canadians have gone to the polls. The Liberals under Justin Trudeau have won a majority government. After 10 years in power, the Conservatives under Stephen Harper are out. Stephen Harper based his campaign on leadership, and the country responded. The election results clearly demonstrate that Canadians lost faith in Mr. Harper and were ready for a new type of leader. Justin Trudeau is relatively new to the political scene and Canada is waiting to see what kind of Prime Minister he will be. If he's to take charge and start solving the problems that have arisen under the previous administration, he needs to think seriously about what it means to be a good leader. Stephen Harper, on the other hand, has had a lot of time to show Canadians what type of leader he is. According to Patrick Brazeau, the suspended Conservative Senator from Quebec, Mr. Harper was a "control freak" who "shut down" and "silenced" those in his caucus who challenged him. When it came to his leadership style, Mr. Harper was often being accused of being autocratic and polarizing. He was seen as secretive, doing deals behind closed doors. For someone who needed to be in control, this wouldn't be surprising. Mr. Trudeau, being young and less experienced, is at somewhat of a disadvantage due to his enormously steep learning curve. He can make the most of this, however, if he surrounds himself by good advisors -- people who are seasoned and wise. But he really has to listen to them and not let any issues of ego get in the way. Qualities we didn't see in Mr. Harper that we'd very much appreciate seeing in Mr. Trudeau would include transparency, inclusiveness, thoughtfulness and compassion. These attributes would do a lot to inspire our faith and trust in him. Leadership isn't just about being able to get a job done, or even about delegating well. It's about inspiring people, bringing out the best in everyone, encouraging questions and being self-reflective and capable of learning. It's about setting a good example, and being a role model that others want to follow. A good leader isn't in it for the money, the power or the popularity. They should be passionate about their cause and willing to make certain sacrifices to achieve their goals. A good leader is never cynical, jaded, or contemptuous toward others. A good leader is confident but not arrogant, self-assured but flexible and willing to change, forceful but not a bully, compassionate but not cowardly, and courageous but not foolhardy. A good leader brings people together, listens to them and takes seriously what they have to say. They're humble and recognize that there's always more to learn. They understand that everyone around them has the potential of being their teacher, mentor and guide. Above all, a good leader takes responsibility for their choices and doesn't pass the buck. When they make a mistake, they own up and promise to learn from this mistake and do better in the future. A good leader is confident enough to tolerate their own imperfection and to trust that those around them believe in them enough to accept them, even when on occasion they fall short. A good leader believes in themselves, in their country and in their citizens, and a good leader does the right thing, even when this is difficult; they do the right thing even when this isn't a popular position. They care enough about what they're doing to risk losing a few popularity points, every now and then. Sign up here for my free monthly wellness newsletter. November is all about family dynamics.